HIAB 700 E-6 HI PRO XS + JIB 165 X. 6 x hydr. + 1 x manual + JIB 5 x hydr. × 1x manual boom. Total 11x hydraulic + 2 x manual. Cran: (3.3m - 17 900kg, 4.3m - 14 300kg, 5.9m - 10 200kg, 7.7m - 7 500kg, 9.6m - 5 900kg, 11.7m - 4 700kg, 13.7m - 3 900kg, 15.9m - 3 400kg). Perfect condition. Full service in Volvo from new to this year. New Turbo and more new parts in service. 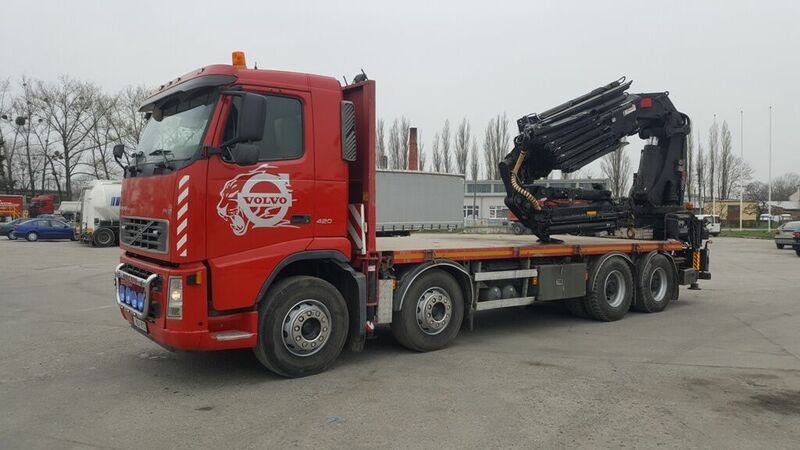 VOLVO - FM12 4200 Pritshe 6,60m + Kran! Top Zustand! VOLVO - FH12 460 Pritsche 5,40m + KRAN *6x2* Topzustand! VOLVO - FM12 380 Pritsche 7,20m + Kran* 6x4*Top Zustand!